I believe in one secret and ineffable LORD; and in one Star in the company of Stars of whose fire we are created, and to which we shall return; and in one Father of Life, Mystery of Mystery, in His name CHAOS, the sole viceregent of the Sun upon Earth; and in one Air the nourisher of all that breaths. We know from Crowley’s other writings that “the sole viceregent of the Sun upon Earth” refers to the PHALLUS, which is, therefore, to be identified with the name CHAOS. The PHALLUS, then, in its capacity as “the sole viceregent of the Sun upon Earth,” represents the creative and life-giving Fire as it manifests itself in living beings who dwell on the surface of this planet. The name BABALON, like the name CHAOS, comes from the 12th – 2nd Aethyrs of Liber CDXVIII, where it is identified as a Name of Binah, the Great Mother, the Heh of Tetragrammaton paired with the Yod of CHAOS. In Gnostic terms, Babalon represents SOPHIA, the Mother of All; and, with CHAOS, the first Syzygy: the first of the dual principles responsible for manifested existence. Visconti: a French corruption of Mahomet (Mohammed). Von Hammer-Pürgstall: Heb. Maphtah Bet Yahweh = The Key to the House of God. Raspe: Gk. Baphe Metros or Baphe Metios = the Baptism or Tincture of Wisdom. Mackey: a symbol of mortality. Crowley: BAFOMIThR = Father (of) Mithra; also 8 letters indicates Mercury; also 729 = Kephas, stone, the name Jesus gave Peter as the founder of the Church, the Cubic Stone which was the Corner of the Temple; also the inverted pentagram, the hermaphrodite fully grown; also the original being, Zeus Arrhenothelus or Bacchus Diphues; also the Androgyne, the hieroglyph of arcane perfection; also the emblem of Pan Pangenetor as symbolized by Atu XV, the “Devil” Trump of the Tarot. by AThBaSh Temurah: בפּומת (Baphomet) = שופּיא (Sophia). 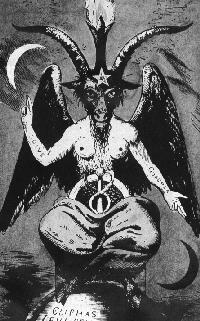 Those familiar with the Simonian Gnostic treatise called the Apophasis Megalê will also recognize Baphomet as the Father, the Demiourgos which manifests in the Middle Space between the male Great Power and the female Great Thought. The following are all symbols attributable to Baphomet from different perspectives: the Sun and Moon conjoined; the Point within the Circle; the Greek letter Theta; the Orphic Egg; the Heart girt with a Serpent; the Kundalinî Serpent entwined about the Svayambhu-Linga; the Ardhanârîshvara image; the Greek letter Upsilon; the Roman letter Y; the Right Pentagram; the Averse Pentagram; the Hexagram (as union of Fire & Water); the Two Stars (5 and 6 pointed); the Unicursal Hexagram (as Sun and Moon united by the 4 Elements); the Sekhemti Crown (the Crown of North and South United); the Cone; the Rose and Cross; the Ankh; the Emblem of Venus; the Emblem of Mars; the Emblem of Mercury; the Caduceus; the Chief Adept’s Wand; the Celtic Cross; the Solar Cross; the Orb and Cross; the Crucifix; the Wheel; the Skull and Crossbones; the Skull with a Green Sprig or Leaf in its mouth; the Tree growing from a corpse; the Grip; the Praying Hands; the Child; Jesus in the Mandorla; the Alpha and the Omega; the Dove descending upon the Chalice; the Dolphin sporting in the Sea; the Gryllus; the Square and Compasses; the Level and Plumb; the Lance and Cup; the Sword and Disk. “Lord of Life and Joy, that art the might of man, that art the essence of every true god that is upon the surface of the Earth, continuing knowledge from generation unto generation, thou adored of us upon heaths and in woods, on mountains and in caves, openly in the marketplaces and secretly in the chambers of our houses, in temples of gold and ivory and marble as in these other temples of our bodies, we worthily commemorate them worthy that did of old adore thee and manifest thy glory unto men, Lao-tzu and Siddhârtha and Krishna and Tahuti, Mosheh, Dionysus, Mohammed and To Mega Thêrion, with these also, Hermês, Pan, Priapus, Osiris and Melchizedek, Khem and Amoun and Mentu, Hêraclês, Orpheus and Odysseus; with Vergilius, Catullus, Martialis, Rabelais, Swinburne, and many an holy bard; Apollonius Tyanæus, Simon Magus, Manes, Pythagoras, Basilides, Valentinus, Bardesanes and Hippolytus, that transmitted the Light of the Gnosis to us their successors and their heirs; with Merlin, Arthur, Kamuret, Parzival, and many another, prophet, priest and king, that bore the Lance and Cup, the Sword and Disk, against the Heathen; and these also, Carolus Magnus and his paladins, with William of Schyren, Frederick of Hohenstaufen, Roger Bacon, Jacobus Burgundus Molensis the Martyr, Christian Rosencreutz, Ulrich von Hutten, Paracelsus, Michael Maier, Roderic Borgia Pope Alexander the Sixth, Jacob Boehme, Francis Bacon Lord Verulam, Andrea, Robertus de Fluctibus, Johannes Dee, Sir Edward Kelly, Thomas Vaughan, Elias Ashmole, Molinos, Adam Weishaupt, Wolfgang von Goethe, William Blake, Ludovicus Rex Bavariæ, Richard Wagner, Alphonse Louis Constant, Friedrich Nietzsche, Hargrave Jennings, Carl Kellner, Forlong dux, Sir Richard Payne Knight, Sir Richard Francis Burton, Paul Gauguin, Docteur Gérard Encausse, Doctor Theodor Reuss, and Sir Aleister Crowley—oh Sons of the Lion and the Snake! with all Thy saints we worthily commemorate them worthy that were and are and are to come. Baphê is Greek for “dipping,” as in a vat of dye; Mêtis was a Titaness who presided over the fourth day of the week, the planet Mercury, and all wisdom and knowledge. After the overthrow of the Titans by the gods, Zeus developed a lust for Mêtis and seduced her. An oracle predicted that their child would be a girl, but that the next child of Mêtis, if there were one, would be a boy who would eventually depose Zeus as he had deposed Cronus. To avoid such a catastrophe, Zeus trapped Mêtis and swallowed her whole. Days later, Athena, the goddess of wisdom, burst forth from Zeus’s skull. A version of this essay was originally published in Red Flame No. 2 – Mystery of Mystery: A Primer of Thelemic Ecclesiastical Gnosticism by Tau Apiryon and Helena; Berkeley, CA 1995 e.v.